Getting to know Store Owners of your country is a no-brainer since, as I already mentioned, you will have to get in contact with them in order to plan dates, kit orders and other things alike. You cannot imagine how much of a mess things can become when a store gets a regionals or nationals kit and they barely have any contact with you or any organizing person of your community for that matter. Keeping in contact with active players of your area can also be extremely important, since they are the ones that keep your tournaments alive. Making sure that they can make it to a tournament makes the tournament ten times more likely to be a success, since you know it’s going to be more than just you there on the day of the event. Plus, they can help with very important community decisions that you have to make. All of these people can help you in one way or another. Even if you are an artist yourself and you can make alternate art cards for unofficial prizes in future events, you will find that it is very time consuming to be doing this on your own. The worldwide Netrunner community has a lot of amazing people that all work together to bring amazing things to events for both old and new players of the game. Getting in contact with them will not only save you time but also give you ideas and opportunities that will take your organizing to the next level. I was personally lucky enough to be in the circles of various artists due to my job so I was able to find various people that we could commission in order to get some beautiful unofficial prizes in our events. Even more so, the more generous and kind you are to people, the more you will get in return, because some people are just amazing like that. We were lucky enough to have an agreement with various fan artists at various points in time where we were able to trade some of our excess official promos for unofficial things like click trackers and other custom prizes. Having met people like Krystian, I was personally able to go even further into being creative for Netrunner and its community. You never know who you might meet! Take for example the time we ran the Nationals of 2014 and we had about 90 extra Alternate Art Noise promos. After talking with the store organizer for the event (Steven of Den Haag Spellenhuis at that point) and telling him that we could sell those for a good amount of money for both the store and the community, he agreed to let us do that in order to fund various future things we would be buying for the community. Through selling and trading a lot of those, we were able to, print playmats as rewards for the yearly Invitationals tournament of the Netherlands, print custom cards that we used as participation promos for all of our events and also run extra events at Spellenhuis which in turn allowed the store to make some money as well. One HUGE mistake that I made at the time was that I handled this all on my own and that backfired big time. It is very understandable for people to think that someone is taking advantage of community resources when you’ve just ran an event and then the next day you are trading off 30 Noise promos. So the mistake in this case was that I did not make it clear why I was doing all of this and on top of that, I did not do it in a very clear way. If you are going to be trading off / selling promos in order to help your community, make sure you do it WITH your community and also by providing full and clear information as to why you are doing it. Thankfully, our community’s reputation grew and since people now know what we do here, the whole misunderstanding of me selling those promos is sort of gone, but it is most certainly a lesson to be learnt. It is also something that you really need to try and keep apart from your own endeavours as a player (selling your own personal promos for example). Being social, involved and positive is one thing, but keeping others involved is a whole other matter. The best way to do that as an organizer or community runner is by keeping the “hype” alive. This can happen through constant updates on the game or various event reports for example. What we do/did here in the Netherlands a lot, is that after every tournament, we post pictures and a small synopsis of what happened during the tournament. This helps make people that did not attend a certain event feel like joining the next one. Seeing that the community is alive might actually start making you feel like joining in on the fun as well. Pictures are extremely important in this case. Take pictures of people playing, the prizes you are offering and even the food that is on the tables. We for example take pictures of weird interactions that might take place in certain games and then post them with a little story below them. This usually happens a lot in Draft. What we also do a lot is try to keep conversation on the game as active as possible through the community facebook group that we have. Posting news about new expansions or other things that are happening in the overall Netrunner world can be very fun even for the people that are not as engaged in the game as others are. You may have heard of things like 1.1.1.1. and Cube Draft formats. 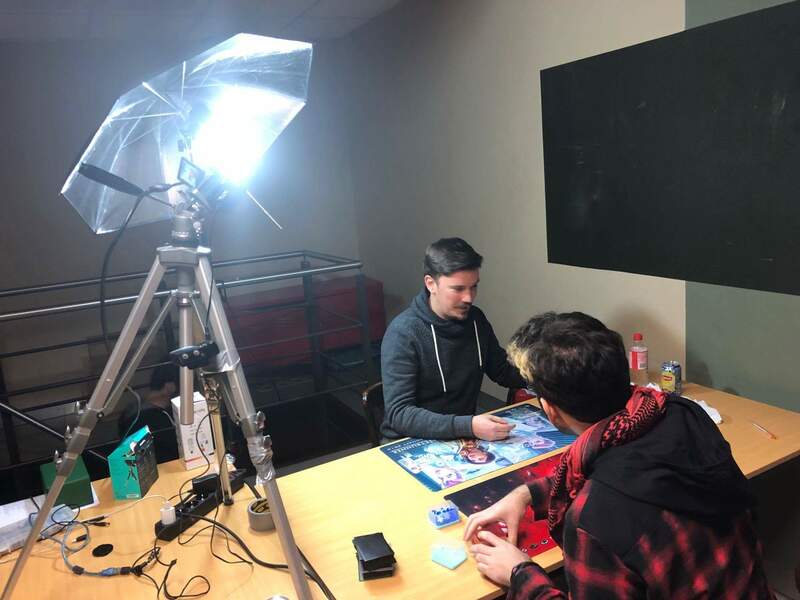 Apart from the casual game night kits where people come with their constructed decks to play, there are a bunch of other formats that you can take advantage of in order to get people involved and coming to your events. The one I recommend the most is the Cube Format since it allows for any kind of player to join in on the fun and find out why Netrunner is as fun as it is. I believe that because basically there is no entry requirement other than a small fee and knowledge of the game’s rules. It allows for people to learn through mistakes and actual games instead of having to face very oppressive or even mildly oppressive pre-built decks that even mediocre players can pilot well against total noobs. 1.1.1.1. that restricts deckbuilding to one core set, one data pack, one deluxe and one playset of cards. The official Cache Refresh format. Completely casual nights where you do not run any sort of point system. Other formats such as deckswapping or team-based events. Just innovate and try different things until you see what fits your community the best. Next page continues with a Synopsis.